Automation testing tools help testers and also developers to smoothly and easily computerize the testing phase of Software Development Life Cycle, helps in finding defects in a software or a product which can further improve the quality of the final product/ software. The main aim of this blog is to carry out a comparison and knowing the concepts, features, build and functionality of automation tools such as the Ranorex, AutoIt V3 and T-Plan Robot. Ranorex is a very popular and powerful UI automation or Functional testing automation tool. It has purely Dot Net built API. It is one of the all-rounder or we can say most multifaceted tool since it supports testing of different applications such as web-based, desktop and mobile applications which uses technologies such as Qt, .NET, Java, HTML, jQuery, AJAX, ASP.net, iOS application testing, android and many more. It covers a wide variety of operating systems and number of browser environments such as Internet Explorer, Mozilla Firefox. Ranorex aims in providing the best possible recognition for all types of software applications and uses XPATH expressions for unique identification of UI elements. Ranorex Recorder is a robust tool for record and playback user actions. It has the capability to generate scripts in C#, VB.Net and Python languages which can be edited and customized. It is easy to work since it does not require one to learn scripting language. Easy to learn in short period and has low cost entry point as compare to the “big guys”. One can optionally specify and change the automation speed at any time in the code. Provides unified incorporation for 32 and 64 bit operating systems. Integration of Ranorex repositories for object-based automation. Maintainable recordings via the actions table editor and reusable code modules. Validation mode for use during recording sessions. Good support from their ‘support and development teams’, the Ranorex team really care and it shows, unlike the “big guys”. Permits testers with less programming awareness to generate professional test modules with Ranorex Recorder. Ranorex supports Data driven testing and variable creations which helps in creating more robust test-cases and test-suites. Also Ranorex Spy provides all available information in the info tabs i.e. ‘Overview’, ‘Detail’ and ‘Screenshot’ and generates a well done test report after the test execution which helps tester in validating result more precisely and to the point. Ranorex have some limitations as well as it works for windows but does not supports MAC and testing of Android web-based and hybrid applications. Also there is no option to export the test-script to different languages like Java, VBscript etc. Ranorex Studio- Ranorex Studio provides an ‘all-in-one environment’ for developing Ranorex test automation projects. It has common IDE features like syntax highlighting, code completion, debugger etc. It integrates all of the Ranorex tools together by blending Ranorex Spy, Ranorex Recorder, Ranorex Object Repository and a powerful Ranorex Library in one professional environment. T-Plan Robot (formerly known as VNCRobot) is an adjustable black box automated testing tool available in the market. Developed on generic image based testing principles, it was designed to automate user interaction with a graphical desktop. It is carefully designed using Java architecture and supports Java test-scripts as well as a proprietary scripting language, this allows integrating black box GUI tests with a java project code base. 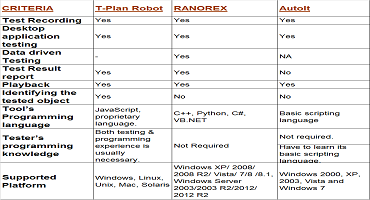 T-Plan Robot runs on and automates all major systems, such as Windows, Mac, Linux, UNIX, Solaris, & mobile platforms such as Android, iPhone, Windows Mobile, Windows CE, Symbian. 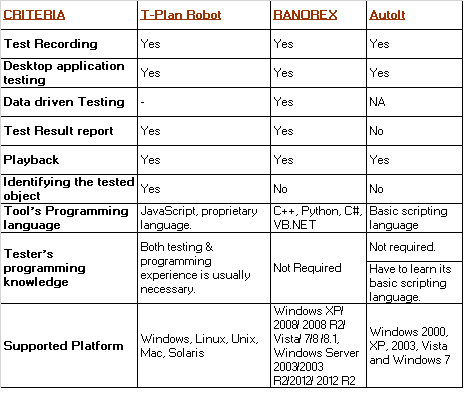 T-Plan robot supports testing web-based, mobile and desktop applications. Also have capability of Browser testing – Chrome, internet explorer, firebox, safari and Game testing- Flash, HTML5, FLEX, JQuery & Ajax, Silver Light. Can be used in any operating system even Mac which is not supported by Ranorex. User can also test multiple application at once , example – testing 2 iphones and an iPad all together. It has some limitations like the tester needs to have the knowledge of both – testing and programming /coding. Migration risks resulting from vulnerability to test environment changes; Migration of a test suite to another test environment usually requires recreating images of GUI components used for verification. Also as per our experience in understanding the working of tool, it takes more time to learn as compared to Ranorex, thus a bit complicated. AutoIt v3 is a freeware automation testing tool which uses BASIC like scripting language which means that most people who have ever written a script or used a high-level language should be able to pick it up easily and is designed for automating Windows GUI and general scripting. At the time of automating the tasks it uses a combination of simulated keystrokes, mouse movement and window/control manipulation. It is used to test only desktop applications. Easy to learn BASIC-like syntax. Simulate keystrokes and mouse movements. Interact with all standard windows controls. Scripts can be compiled into standalone executables. Create Graphical User Interfaces (GUIs), including message and input boxes. Regular expressions can be used. Scriptable RunAs functions. Compatible with Windows XP / Server 2003 / Vista / Server 2008 / Windows 7 / 2008 R2 / Windows 8 / 2012 R2. AutoIt is fully Unicode and includes X64 version support. Works with Windows User Account Control (UAC). 2. Au3Recorder – It comes with a recorder that follows our movements as one works on the computer. This allows us to click a Record button, perform a manual task and replay that task any time. To record an action- Go to install\Extras\Au3Record\, and launch Au3Record.exe to record an action that Au3Record will then save as source code that you can use in your scripts. Out of the 3 tools described above, if one wants to go for an automation tool for desktop application without spending on purchasing the tool then AutoIt is a good option available. If tester with less programming knowledge wants to create robust test-cases and want a complete package for testing web, mobile and desktop application then the best option available in the market is definitely Ranorex tool which is now being widely used by many big names of the IT industry. T-Plan is also a good option for automation testing different application and also supports most of the Operating system but it is good only if the tester is apt in coding and have some experience in the programming language as well. Disclaimer: This is from my understanding and study of the testing tools. For more accurate information please refer the official website of respective tools.